If you can't have something all the time, don't you want it more? That's what's happening with fans of Licketty's BBQ, which you can only get on game days at CenturyLink Field. Or you can have them cater your party. Late Microsoft co-founder and philanthropist Paul Allen had favorite types of foods, one of them being barbecue. He tasked his culinary staff at Vulcan Inc. to recreate flavors he loved in Albuquerque. The staff, including Zack Ramirez, Vulcan's culinary coordinator, studied hard. It was tough, but they traveled to Dallas, Austin, and other points BBQ, trying famous spots like Franklin Barbecue and Mueller's Barbecue. "We learned a lot; people were so generous in helping us, taking us back to when they learned to smoke from their grandpappies. They use hickory wood, so we do, too. It's a simple process but takes patience and care. We add salt, which caramelizes nicely, and pepper and let the brisket speak for itself. It creates that 'bark' on the outside which is a special thing to learn. There are opinions on the heat, between 250-275°. I'm in the 275° camp," says Zack. 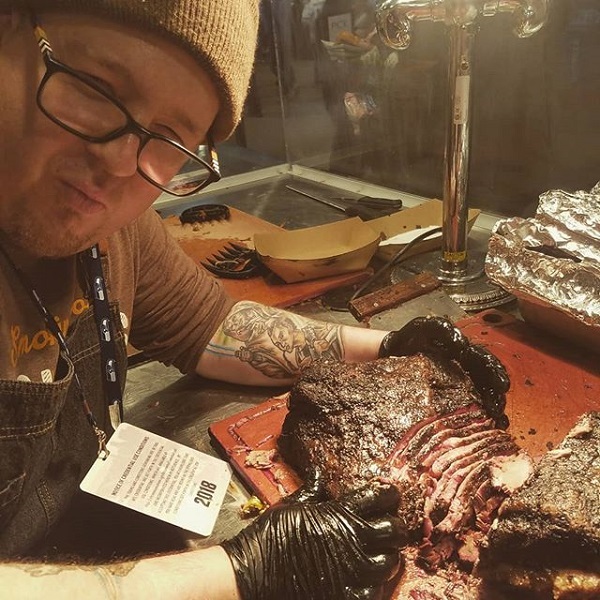 "We stoke the fire for 12-14 hours, wrapping brisket in butcher paper half way through. It holds in the moisture, lets in the smoke, and is a barrier to burning. All the good barbecue places we visited use butcher paper. There's a thing called Texas Crutch which means the brisket is wrapped in foil, but we don't use it while cooking. We do use foil before we take it to the stadium. It's more of a cleanliness thing; otherwise there would be juices everywhere!" Due to the stadium location, they only offer three things: brisket, pulled pork, and sausages. They used to have ribs, but now those are only used for catering and special events, along with turkey breast and sides. "We continued to tinker as we went along and are really pleased with the product we offer. We use Prime beef for the brisket; we find there's a noticeable difference between Choice and Prime. Part of it has to do with consistency. When you're smoking mass amounts of meat, you want the marbling to cook at the same time. This is a great job: we can learn everything we put our minds to. I was really amped up to take part in Paul's vision and get the general essence of what he was looking for, then make it our own thing." They tested a lot of sauce recipes and settled on their 23rd batch, hence the name Batch 23. When they were ready, they took to the northwest plaza of CenturyLink and smoked there. "That really drew people in," laughs Zack. Eventually it made more sense to smoke offsite and truck it over in mobile hot boxes. Still, your first bite will tell you, it's only been off the smoker for one hour. "That's important to us," says Zack. "It doesn't taste the same when it's cooled and reheated. We take it off the smoker when it's just above 200°. 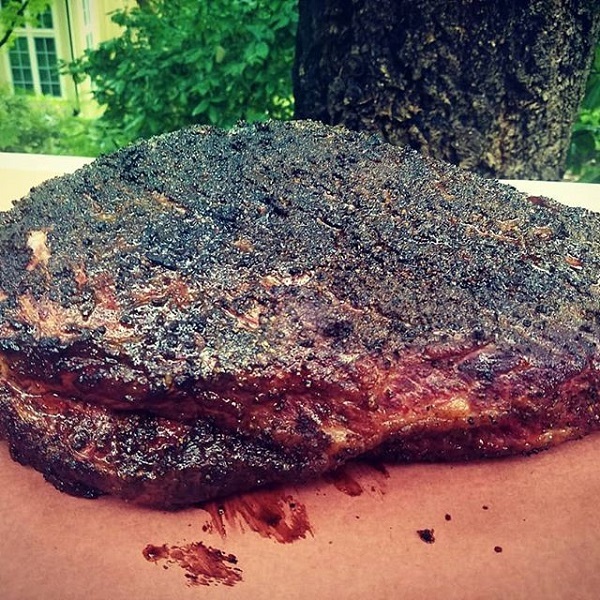 It's a fine line between a brisket holding its shape but being able to pull it apart." The Vulcan culinary team includes Chet Wallenstein, Head of Culinary Operations, and Phil Charron, the assistant pit master, along with Zack, pit master/culinary coordinator. "It's Phil and me at the stadium and cooking before. He's like a slicing machine. We love doing this, have a lot of fun, and are really proud of what we offer to the 12s. Plus we can hear the screams of fans and look up to see what happened on the TVs. Feedback has been really positive, and people will come from the opposite end of the stadium to get the barbecue. We produce 500 pounds of protein total, so there is a finite amount. If you want brisket, you better either have it early or be in line by halftime. Otherwise, your choices are pulled pork and sausages, which are really good. I love my job as a whole, but barbecue is one of the best parts." Zack has been a personal chef most of his career. He grew up in Arizona and his first job was at an Applebee's. 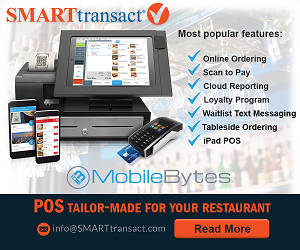 "I was a host, then moved to the kitchen and learned all the jobs there". At the University of Arizona, Tucson, he was a house boy at a sorority, learning a lot from the chef. His then girlfriend, now wife, had a job transfer to Seattle, so he moved here in 2010 and became a chef at a sorority house. "I have a thirst for knowledge and like cooking as well as interacting with people. I was poking around and found this job at Vulcan. It was sheer blind luck. I have learned so much here. Plus they really take care of people, it's a great work environment. It's a place where I feel I can do anything; it really drives innovation. We're always thinking 'What can we do to help worldwide?' I'm doing my best with barbecue!" Zack has been with Vulcan for 6-1/2 years. Licketty's started about three years ago. There are no current expansion plans for Licketty. Between the stadium and their normal catering, dinners, and charity events, they're busy. 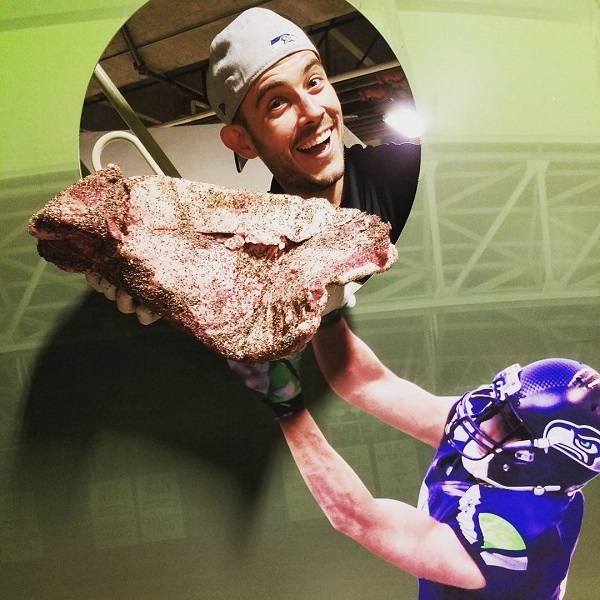 So for now, head to CenturyLink on game days and taste the love they put into their barbecue. Whether the Hawks win or lose, you'll still come away with a great feeling.